Panasonic wasn't the sole company developing WiGig, a multi-gigabit short-range wireless communication technology transferring data via the ultra-high-speed 60GHz channel, but it's the first one to do squeeze it in something as small as a smartphone. 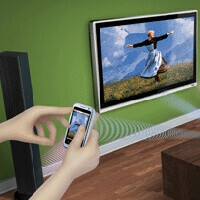 The technology consumes extra energy due to its high frequency and had only been adapted to larger appliances like TV sets. The reason underlying Panasonic's obsession with multi-gigabit speeds? We could name a few but being able to stream full HD content wirelessly is among our best guesses. WiGig promises up to 20 times the speed of current wireless LANs, but within a much narrower range, usually limited within a room. It is compatible with standard 2.4GHz/5GHz Wi-Fi bands and Bluetooth 4.0. While multi-gigabit sounds pretty vague, even at its lowest – 2Gpbs – the technology should be more than enough of streaming some high quality videos, but it's the impressive speeds of up to 5 gigabits that are planned. And when it comes to timing, Qualcomm's tri-band 2.4GHz/5GHz/60GHz Wi-Fi AR9004TB chipset fit perfectly as it was announced mere days ago with sampling starting this summer. Just when can we expect to see it in real devices? We don't have an exact answer for that, but judging from all visible clues, the coming year or so sound like a right guess, so stay tuned.